4G LTE Benefit: 4G LTE modules offers more benefits interims of speed and performance compared to the 3G modules. Compared to 3G modules, 4G LTE modules offer higher downlink and uplink data rates. See data rate information below. 4G LTE modules supports packet-switched traffic only, so communication is all IP-based. For network operators, LTE networks offers high spectral efficiency. 4G LTE Standards: LTE standard is controlled by the 3rd generation partnership project (3GPP). LTE provides an evolutionary path for both CDMA and GSM networks and it overlays upon existing 3G networks. LTE standard is based on orthogonal frequency division multiple access (OFDMA) solution. Wider bandwidth solution boots data capacity in high0demand dense urban areas. 4G LTE Speed: Data rates of 4G LTE modules depends on the network conditions and performance of the device. The actual LTE speeds are around 6-10 Mpbps (Downlink) and 5-8 Mbps (Uplink). 4G LTE Frequency Bands: 4G LTE modules can operate on following bands. The band configurations of the modules are dependent on teh carrier network. 4G LTE Module Form Factors: Since carriers are rolling out 4G LTE networks slowly, 4G LTE modules are primarily used within laptops and tablet devices. 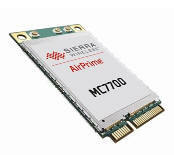 For laptops, PCIe is the most common LTE module form factor. For tablet LGA form factor is one option, but many tablet vendors are directly integrating 4G LTE chips on their designs. The adoption of 4G LTE modules in the M2M segment will happen over time as LTE networks offers higher bandwidth and lower latencies. Power : Power interface is mandatory for all modules and the supply ranges from 3.0V – 4.5V. USB (Universal Serial Bus): USB is usually the primary data interface used on 3G modules since it supports higher data rates. UICC (Universal Integrated Circuit Card): GSM-based 4G LTE modules will have UICC interface which is based on IS0 7816-3. Antenna: Antenna connectors are generally available on-board the 4G LTE modules. To improve receiver performance, a diversity antenna connector is also sometimes available on the modules. GPS (Global Positioning System): Many of the 4G LTE modules have integrated GPS solution. GPS antenna port may be on a separate port or shared with the diversity antenna port. PCM (Pulse Code Modulation): PCM interface in 3G modules is used for digital audio transfer. Analog Audio Interface: For devices that require voice support, 3G modules will provide analog audio interfaces. Before the 4G LTE module can be commercially used with in a device, it has go through several certification process. Global certification Forum (GCF) : GCF enables certification of any mobile device based on 3GPP technologies. GCF certification is supported by leading operators from every region of the world. GCF approval requires both conformance lab testing and field trials. PTCRB : PTCRB is the North American operators certification body. It provides a framework within which device certification can take place for members of teh PTCRB.3G modules are tested at PTCRB accredited labs which manage the certification process. FCC : In order to obtain a modular approval teh FCC has identified requirements that must be addressed in the application for equipment authorization. These requirements are specified in this FCC document. Network Operator Certification: In addition to PTCRB/GCF & FCC, the module should also be certified by the network operator. In fact, the network operators might have industry certifications as a pre-condition for lab entry. 3G Benefit: 3G modules offers more benefits interims of speed and performance compared to the 2G modules. Compared to GPRS and EDGE modules, 3G modules offer higher downlink and uplink data rates. See speed comparison below. Latencies on 3G network is considerably better than 2G networks – WCDMA (150 ms), HSPA (100 ms), HSPA+ (5ms). For network operators, 3G networks provides better use of wireless spectrum compared to the 2G networks. 3G Standards: The air interface standards for GSM-based 3G modules are developed by 3rd Generation partnership Project (3GPP) which is a collaboration between groups of telecommunication associations. For CDMA-based 3G modules, the standards are developed through 3GPP2 group. 3G Frequency Bands: 3G Modules operate at variety of frequency bands depending on the carrier network. Typically a module SKU will be configured to support certain frequency bands to operate on a certain geographic region or a certain carrier. 3G Module Form Factors: PCIe is the most common form factor available through many module vendors. However for devices that have size constraints, modules incorporating surface mount technologies such as Land Grid Array (LGA) or Ball Grid array (BGA) offer smaller sizes. Modules with proprietary form factor are also offered by vendors. Lack of M2M module standards is one of the barriers for adoption and there are efforts underway by the industry to address this issue. UART (Universal Asynchronous Receiver/Transmitter): Some host devices might use UART, though mostly it is used for debugging purpose. UART rates vary from 1200bps to 115200bps. UICC (Universal Integrated Circuit Card): GSM-based 3G modules will have UICC interface which is based on IS0 7816-3. Antenna: Antenna connectors are generally available on-board the 3G modules. To improve receiver performance, a diversity antenna connector is also sometimes available on the modules. GPS (Global Positioning System): Many of the 3G modules have integrated GPS solution. GPS antenna port may be on a separate port or shared with the diversity antenna port. SPI(Serial Peripheral Interface) :SPI interface is generally used to connect to the external display devices. I2C (Inter-Integrated Circuit Bus): I2C interface is used to communicate with external display device or storage device. SDIO (Secure Digitial Input/Output): SDIO interface is used for interfacing with external SD card. Before the 3G module can be commercially used with in a device, it has go through several certification process. PTCRB : PTCRB is the North American operators certification body. It provides a framework within which device certification can take place for members of tech PTCRB.3G modules are tested at PTCRB accredited labs which manage the certification process. GSM/GPRS standards encompass a wide range of functionality and performance. Simultaneous registration for GPRS and GSM service but only one mode in operation at any one time. GSM or GPRS, manually switched. Classes 19 to 29. Up to 8 active slots in half-mode duplex (i.e. Rx or Tx only). Classes 13 to 18. More than 5 active slots per frame. The range of data rates is substantial. Those of primary interest today being: GPRS up to 53.6kbps, GSM (circuit switched) 14.4kbps, GSM High Speed Circuit Switched Data (HSCSD) 53.6kbps (Coding Scheme 2) and 85.6kbps (Coding Scheme 4). At Wireless Integrated we are currently focusing on Class B and Multi-slot up to Class 12 - in line with the medium term capabilities of deployed Networks and viable terminal economics. EDGE (Enhanced Data rate for GSM Evolution) offers further throughput improvement for GSM by adopting 8-PSK modulation in place of GMSK, thereby taking peak data rates to 384kbps. A primary impact on Base-station and Terminal implementations is the need for Linear RF amplification - an area in which Wireless Integrated has considerable experience.